Once upon a time there was the brave pirate captain. One day the crew revolted, set him on a boat and left in the ocean. But he survived, fought the shark and gathered the new better crew to sail the ocean again. 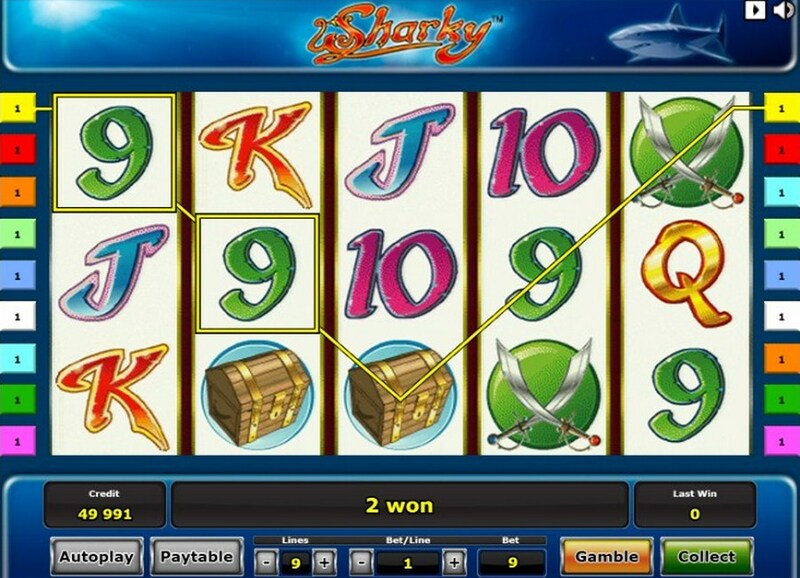 The whole game design of Sharky slot is dedicated to this thrilling story. 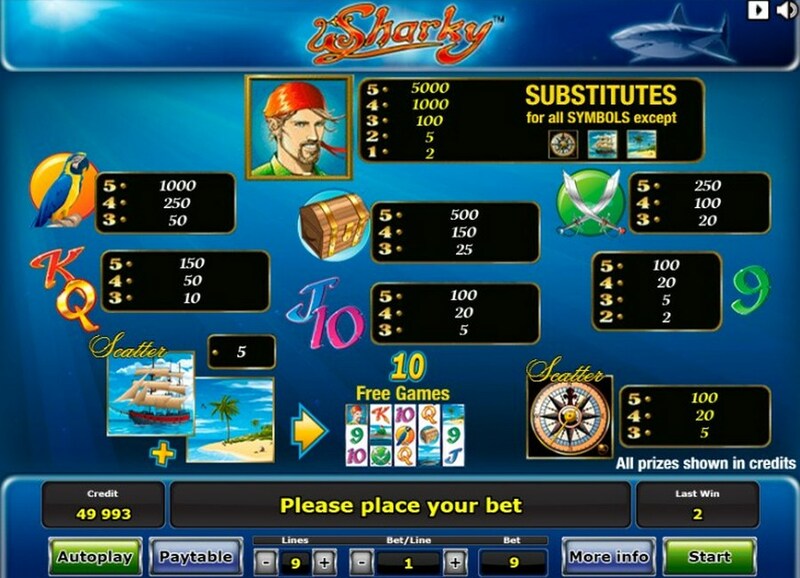 Slot machine game Sharky is a real resource of fun for gaminator slots players by casino software developer Novomatic. 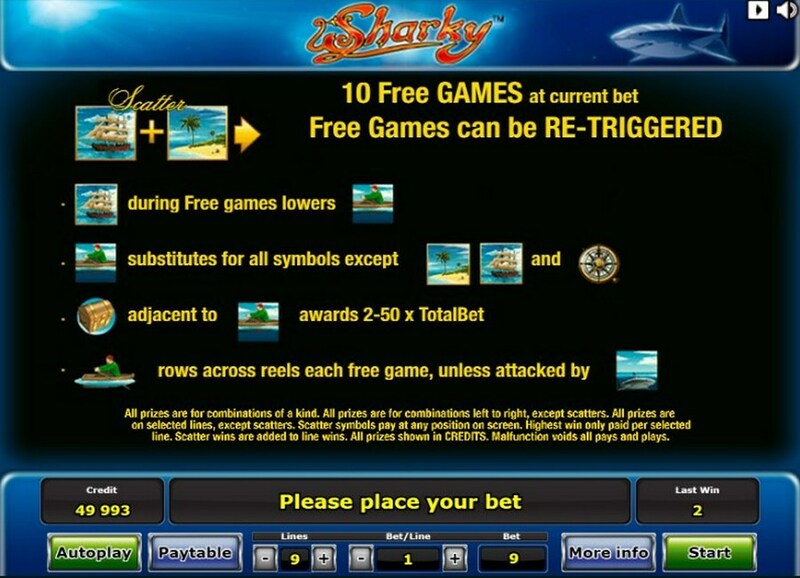 With a classic 9 paylines and 5 reels interface, Sharky's aim is to get the same symbol on all 5 reels. You can even increase your money if you get the free spins feature. Like most of the novomatic-gaminator games, Sharky feature round brings you more chances to win. The slot machine game has several bonus features which can bring you really fantastic winnings. Once you matched the Scatter symbol (with the ship on it) and the symbol of slot with the isle beach you will be awarded with free spins. You can get another 10 spins during the free spins feature if you match this combination again. Every ship symbol lowers the boat on reels. It rows across the reels with every spin and acts as the Wild symbol in addition to the one which is already present in the game. If the shark slots symbol lands on the boat symbol, the last one disappears. Both Wild symbols substitute for any symbol in the game except Scatters. You can also multiply your winnings any time with the help of mini gamble game. Gamble on the color of the last card in the shuffling deck. The game is risky – if you gamble on the wrong card all the credits for the last round will be lost. All aboard the pirate ship as we set sail for exciting bonus rounds and big cash treasures! Take a trip around the Caribbean seas on your big adventure and keep an eye out for Sharky the pirate!